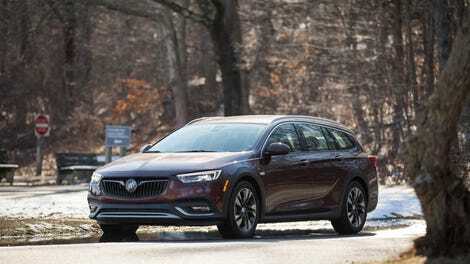 The 2018 Buick Regal TourX is the long-roofed wagon version of the Regal sedan, which makes it the first Buick wagon since the ’96 Roadmaster. You can’t order it with wood paneling, but the TourX is a damn decent comeback of the classic American family car. It’s the American competitor to the the likes of the Audi A4 Allroad, the BMW 3 Series wagon, the Volvo V60 and the Subaru Outback, if you were wondering why the hell it exists. 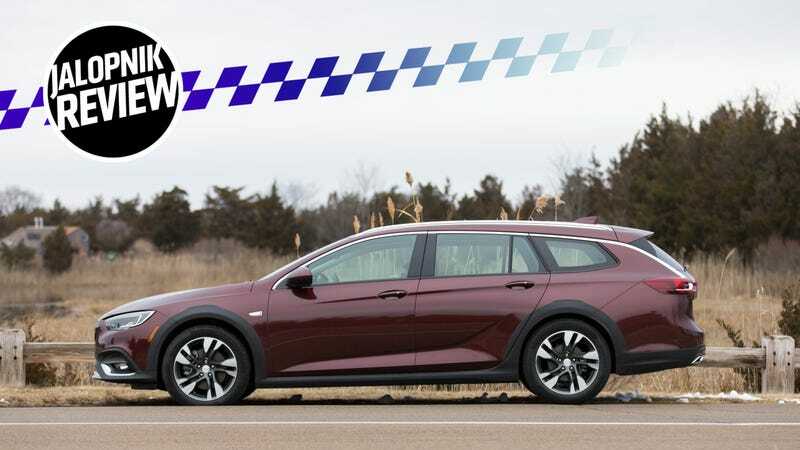 To everyone who thought they were clever by cracking geriatric jokes about the Buick Regal TourX or taking jabs at the badge, I have some news for you. The TourX is a certifiable step away from the hulking land yachts that your grandparents might have driven. It’s tight, polished and hits on all the wagony needs you could have. Everyone else just needs to catch up with that. The wagon is handsome. There’s no other word for it. Clean, straight lines intersecting one another tend to have that effect. There isn’t any additional fussiness in its features, no spangly LED running lights or a lumpy grille shape to snag at your vision. And there are tasteful touches here and there. An attractive silver line runs along the wing mirror, climbs up and traces across the tops of the windows, descends, and curls into a finish within the rear tail light. The belt line has a subtle but elegant upward slant—though it doesn’t sacrifice rearward visibility. The photos don’t lie, though: This wagon is long. Over 196 inches, or more than 16 feet, in fact, according to the spec sheet. It took me a bit to figure out where its long nose ended and how to place it on tight New York City streets. It was narrow enough that squeezing past double-parked trucks wasn’t a problem, but pulling it forward into parking spaces headed by raised curbs took some practice. Would its front bumper have cleared the concrete? Depends; the TourX has about 5.7 inches of ground clearance, which is decent but not spectacular. But, again, this isn’t a lifted wagon. I found ingress and egress here to be preferable to a crossover or SUV, but that could have just been because I am short. In any case, I appreciated not having to climb up into something. Regardless, the TourX is lovely to look at, especially in the Rioja Red Metallic paint that our test car came in. 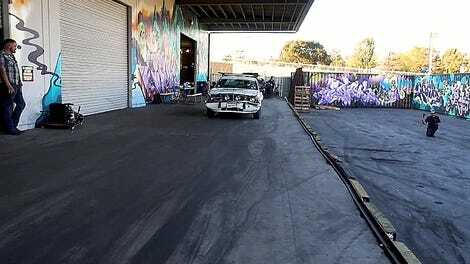 The only gripe I had with it concerned the lines of black cladding snaking along the bumpers and the wheel arches. In my experience, that kind of black plastic doesn’t age well and becomes gray and starchy-looking after a few years of the sun and the elements beating on it. Unfortunately, a Buick spokesperson supplied that removing it is not an option. Sorry, friends. The overall sense I got from the TourX’s interior was function over form. Thankfully, there were no piano-black plastics to get cruddy with fingerprints, but there was a lot of black plastic—though I didn’t mind in the slightest. The TourX has plenty of buttons and dials (buttons and dials! ), clearly labeled and not too numerous, so figuring out how to use all the car’s controls seemed easier than it’s been in more luxurious and complicated cars. The best feature: the infotainment system lets you actually use it while the car is in motion instead of locking you out, as long as you promise that you are the passenger. The backseats provide ample legroom and headroom and I do not imagine that children sitting in car seats will be kicking the back of the fronts. Look, the interior isn’t fancy enough to summon your neighbor and say, “Check this out!” But it has everything you need, laid out in a very clear manner and easily accessible. For people who couldn’t be bothered with things like mood lighting or cabin air freshener, this is great. Perhaps it was the tires that Buick fitted this TourX with, but it was pretty noisy in the cabin at highway speed. My passengers and I found ourselves speaking to each other at slightly elevated volumes. Not shouting, but this car is not exactly the cocoon of luxury we’ve found in higher-spec wagons. The TourX comes standard with with a 2.0-liter turbocharged four-banger, good for a claimed 250 horsepower and 295 lb-ft of torque with all-wheel drive. Could the engine use a little more oomph? Certainly. It won’t knock your face back or take your breath away. And the eight-speed automatic gearbox is sluggish when it comes to kicking down gears when you really need power, which can be frustrating when you’re looking for some urgency. But the engine and the transmission do their jobs well enough, which is merging onto highways and passing other cars. Otherwise, the TourX is perfectly happy just chilling at everyday speed, its four-cylinder drone permeating the cabin. This is how I expect most customers to use it. And while the engine and the transmission border on anonymous, the steering is good! It’s a power-electric system, obviously, but it actually has some weight at low speeds and is never vague or floaty. Tight corners are translated well into your hands, so you know where the front of the car is pointed. The suspension, too, works well with the steering, not tuned so tightly that you’d be jostled from your lane if you hit a bump, but also not so loosely that you have zero feedback from the road. I knew I wasn’t imagining it when I thought the TourX felt light on its feet because I went and checked its curb weight: 3,708 pounds. The Volvo V90 Cross Country I tested, though a bigger car, was 500 pounds heavier at 4,221. Buick claims that its fuel economy comes to 21 mpg city, 29 mpg on the highway and 24 mpg combined. I tried out the car’s adaptive cruise control on a large and open patch of highway and was quite happy with the results. The controls are easy to figure out, the speed and following distance simple to set. Again, as with all other adaptive cruise control systems, you have to stay vigilant while you’re using it. At one point, traffic slowed down very dramatically and I was worried that the system didn’t see the stopped cars soon enough and slammed on the brakes myself. The big draw of the TourX, of course, is the utility offered by its wagon shape. Some of you were wondering what its tow rating is, so I asked Buick. It can tow up to 1,000 pounds. And now, for some numbers. The wagon has 73.5 cubic feet of cargo space with the rear seats folded down, 32.7 with the seats folded up. The Subaru Outback, by comparison 73.3 cubic feet with the rear seats down, 35.5 cubic feet with them up. The Outback is also has about three additional inches of ground clearance, if that matters to you. But because I also felt that a disembodied cargo volume figure doesn’t really help anyone visualize what kind of stuff you can fit in the car, I brought along a tape measure and measured out what I thought to be the most important points of reference for loading things into the TourX. I gave the TourX back at the end of the weekend with a feeling of deep satisfaction. I didn’t yearn to drive it again as soon as I had put it away for the night, nor did I keep looking back at it as I walked away from it in a parking lot. But it was so utterly good at just being A Car. It had all the safety features you can expect in a modern mid-range car (lane-keeping assist, adaptive cruise control, lane departure alerts and a backup camera), but I got the sense that it wasn’t trying to prove any more than that. The Volvo V90 Cross Country, as fabulous as it was, definitely sought to envelop you in a certain Scandinavian ambiance when you stepped into it. The Mercedes-Benz E400 wagon that Patrick tested recently felt like it was trying to smother you with luxury. This Buick is a solid vehicle. Yes, the interior isn’t draped in buttery-soft leather and isn’t sound-proofed to the point where you wouldn’t hear a bomb go off in the near vicinity, but it feels well-built, is comfortable and won’t make you feel guilty for throwing a muddy mountain bike or a couple of slobbery dogs in the back. Because that’s what it’s for. Would you do that to your new $90,000 Mercedes? My bet is no. I don’t have a $90,000 brand-new Mercedes, but that’s neither here nor there. In fact, I’d argue that the biggest thing working against the TourX is the Buick badge on its nose. It’s facing a similar brand shift that Hyundai’s Genesis is, except while Genesis is a new brand with no marks against it yet, Buick has an uphill battle to fight. It still needs to shake the image of “old people” when it’s brought up. Kind of like what Cadillac had to go through, and is still doing. That shift will come. Eventually. Hopefully, if the whole idea of a “Buick” doesn’t die off first. The first thing that needs to happen is a genuinely good car, which the TourX has definitely pulled off. It’s funny, both Patrick and I drove our wagons to the office on the same morning. He saw the dark red TourX go by and exclaimed, very excitedly to his wife, “Look! Someone actually bought one!” But it was just me, returning the car to GM. And he was right, I haven’t seen one other Regal TourX on the road other than this one that I had. So there’s your practical reason right there. Being different.